How to profit by Conserving? Conservation to some is a dirty word meaning being deprived of something, but it should be looked at in a different light. The need for quality conservation products will increase as utility costs rise and demands to conserve our natural resources increases. Imagine conserving our natural resources and not compromising our comfort just adjusting it a little. Not only can that be accomplished, but profiting by doing just that is what will drive the efforts of all to "save the planet" through conservation efforts. There are a number of ways to profit by conserving. I don't mean restricting water or energy usage to the point of no return. You do not want your customers or family to be upset because the toilet will not flush or the lights are to dim to see the burglar outside. The number one way to conserve and profit by it is through technology. Applying the products that are needed to the right location at the right time and with the right results so as to make everyone happy or think there happy. 1- Tailor Flow Rates to Location. 2- Flow Rate Should Be Consistent Regardless of Pressure Fluctuations. 3- Apply Vandal Resistant Products in Public Areas. 2.5gpm controlled to 0.50gpm = 83-90% savings. 2.5gpm controlled to 1.5gpm = 45-70% savings. 3-5gpm controlled to 2.0gpm = 30-70% savings. What does this small effort equal? Do not let your profits go down the drain. Whoosh! There it goes again. Increasingly expensive water being flushed away by your residents umpteen times a day. Flushing alone accounts for a staggering 40% of a resident's water costs. The rest is from showers, sinks and general water use. It's a manager's and building owner's nightmare, and you would probably think there is not much you can do about it. Well, think again! Now you can control your property's water and sewer costs, add thousands of dollars annually to your bottom line profits and actually increase the value of your property with a Residential Property Water Management Program. Will this effort increase your bottom line? You bet your bottom line it will. Will it make your customers or family upset? No, because the flow rate is the right flow rate for the function it was designed for. And maybe nobody will even notice the difference because it's the right flow rate. Just think the more NRG Saver products you install, the more you save. And that's "Increasing Your Bottom Line." Of course a modest investment is necessary, but where have you ever made money without spending first? And this is a sure thing! The payback could be as short as one month of savings. Do not let your property leave you high and dry. For years, uncontrollable water and sewer bills seemed to be commonplace. That is because most buildings -- even those constructed as recently as five years ago -- were not designed with water savings in mind. Most are equipped with "high-flow" plumbing and other antiquated devices that can drain a water meter dry. Finding out where water is being wasted. Develop your Individualized Water Management Program. Conduct a detailed on-site audit and inspection of your property. Water usage at the faucets, toilets and shards should be precisely measured to form a representative sampling of your property's units. The On-Site Audit data, combined with a history of your property's water consumption, should be analyzed to provide a highly accurate summary of where water is being wasted. Generate a comprehensive report that clearly shows present water usage, proposed conservation methods, cost analysis and increases in your property's valuation. With this ANALYSIS you will see the dramatic difference between your property's current water consumption and the potential water savings you will realize after installation of water saving devices. Now you will be in control of your property's water and sewer costs and adds thousands of dollars annually to your bottom line. Actually increase the value of your property with a Residential Property Water Management Program. The savings can start immediately and they will last for the life of your property. Tap into big SAVINGS, Immediately. Right now you can save anywhere from 30% to a dramatic 60% of your property's water sewer costs--without inconveniencing your residents or compromising their comfort. And without construction or disruption to your premises. 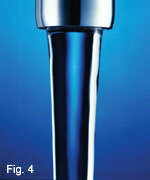 Save $'s on your next water bill! See the results on your next water bill. When you start your Residential Property Water and Energy Management Program, you will be able to stop worrying about spiraling water and sewer costs. You will reap the rewards right away -- with real savings on your very next water bill. And the one after that, and the one after that. You will even save on your energy bills because you will be using less hot water. You will be extending the life of your plumbing and boiler systems. In addition, by substantially reducing your property's annual water costs you will also be increasing its profits, thereby increasing its value. Other great ways to save on energy costs- like miniature fluorescent lights that not only reduce electricity costs. They outlast standard incandescent bulbs' three to four times, saving on labor and energy costs. Common areas, exit signs and stairwells can save tens of thousands of dollars annually in energy costs. In our next Newsletter we will look at the lighting and where savings can be found without compromising the comfort of your customer or family. Care+Guard® - Created for healthcare facilities Careguard® is the perfect combination of hygienic features for faucet attachments: - Built-in AgIONTM anti-microbial protection- Laminar stream (non aerated)- Screen less (no wire mesh screen). Every time a faucet is turned off a few drops of water are trapped inside the aerator (or laminar device) where they stagnate, warm up and eventually evaporate, leaving a film of scale, source of food for biofilm. While insignificant in a residential or commercial environment, such areas where bacteria could possibly thrive and multiply due to biofilm are a concern in healthcare facilities (hospitals, senior care, medical labs). 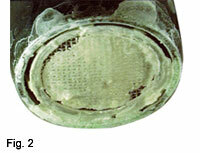 Biofilm is a community of microbes that attach to surfaces. After initial colonization, the biofilm creates a "barrier" to protect the bacteria’s environment thus allowing microbes to thrive and multiply. Various factors can increase the risk of colonization and bacterial growth: warm water, water stagnation (dead legs) and nutrients (scale, sediment). The controlled release of silver ions by the zeolite carrier has been engineered to provide continuous antimicrobial protection. AgIONTM protected products have been proven in laboratory tests to reduce bacteria growth and population on a treated product by as much as 99.999% (log 5 reduction). What factors can enhance colonization and amplify bacterial growth in faucets? Water droplets are trapped inside the faucet aerator. Traditional laminar devices constructed with a thick pile of wire mesh screens trap water droplets even more (Fig. 1). Warm room air (65-80°F) keeps trapped water droplets warm. How is the Silver released? How safe are Silver and AgIONTM? Silver is not toxic to humans and animals. Studies have shown the AgIONTM compound to be less toxic than table salt. An inorganic silver-based compound, AgIONTM antimicrobial materials have NOT been linked to the adaptive resistance seen with organic materials like antibiotics. AgIONTM is registered for broad range of uses including food contact, water contact, HVAC, building products, appliances, textiles, cosmetic and personal products. AgIONTM is listed under the FDA Food Contact Substance Notification for use in all types of food-contact polymers under §21 CFR 176.170. AgIONTM is on the USDA list of non-food compounds maintained by NSF for food processing plants. 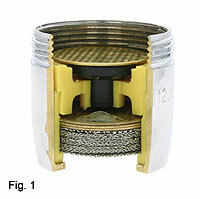 To produce an aerated stream (up to 50% air), white and soft to the touch, air and water are mixed in the faucet aerator's mixing chamber (Fig. 3). While drawing air from the room around the faucet is no problem in residential and commercial applications, it can be a concern in healthcare institutions (hospital, senior care, medical labs). The room air can then contain bacteria that are best kept out of the drinking water and the fine droplets produced by the aerator can add to the risk of contamination by inhalation. Laminar devices do not draw air into the water stream and produce a non-aerated crystal clear stream of 100% water (Fig. 4). This newsletter is produced for our customers and prospective customers and dealers throughout the country. We will try to bring some new concepts in conservation that will be of use to all. 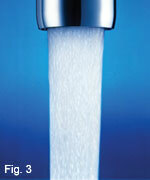 We are a water and energy conservation company dedicated to help our customers save water, energy and money.